Yesterday, After I finished responding to Karen’s question about PMP Exam eligibility for people from Support/ Operations, I chanced upon another question sitting in the Comments Section. It seems that after reading the differences between Contract Closure and Administrative Closure, James, one of the readers of our PMChamp PMP Exam Tips Blog wrote to me about a question. Answer: James, Before we answer this question, try to understand some basics first. If the question asks about the name of a process, then you must identify a process only. Since Option A & Option D are not names of processes, you can eliminate them. Do note that this looks to be an old question based on the PMBOK Guide Fourth Edition processes. 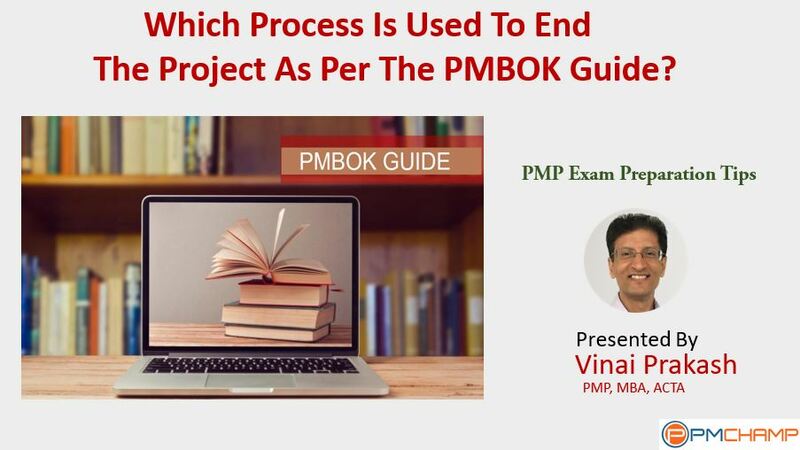 The latest Guide published by PMI is the PMBOK Guide Sixth Edition, available from the PMP Bookstore. You should not refer to old questions or the old guide, as the names of processes have changed, and may misguide and confuse you. For example, the process name “Verify Scope” is from PMBOK Fourth edition. Now the name has changed. It is called Validate Scope. Just this fact alone can help you to choose or eliminate a choice on the PMP exam. Secondly, Close Procurements is not a Mandatory process. It may only be used if there are external procurements to deal with. You will need to execute this process once for each contract. Thus, only one choice remains – Option B – Close Project or Phase. This is the right answer. Close Project or Phase is done at the end of the project, and at the end of each phase. You can not move to the next phase without getting a sign-off on this phase, in this process. Hope this helps James. If you, or anyone else has similar questions, simply post it in the comments below. We are offering Online Video Training for PMP Exam Preparation. Completely Based on PMBOK Guide Fifth Edition. So far, over a Thousand Students have completed and Passed the PMP Exam after watching our PMP exam preparation Coaching Videos. If you would like to join the training and pass the PMP exam, simply join the training at https://www.pmchamp.com website. You will be delighted! What’s Keeping Your From Achieving PMP Certification?